Vectra® Networks is the leader in real-time detection of in-progress cyber attacks. The company’s automated threat-management solution continuously monitors internal network traffic to pinpoint cyber attacks as they happen. It then automatically correlates threats against hosts that are under attack and provides unique context about what attackers are doing so organizations can quickly prevent or mitigate loss. Vectra prioritizes attacks that pose the greatest business risk, enabling organizations to make rapid decisions on where to focus time and resources. Vectra Networks delivers a new class of advanced persistent threat (APT) defense delivering real-time detection and analysis of active network breaches. Vectra technology picks up where perimeter security leaves off by providing deep, continuous analysis of both internal and Internet-bound network traffic to automatically detect all phases of a breach as attackers attempt to spy, spread, and steal within your network. VVectra uses a patent-pending combination of data science, machine learning, and behavioral analysis to detect malicious behavior in the network. 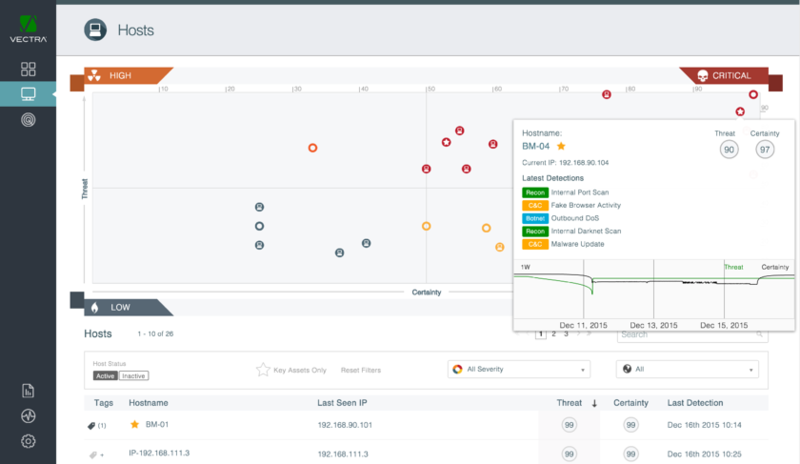 All detections are correlated and prioritized to show an attack in context, and Vectra Networks’ machine learning adapts as attacks evolve. In 2015, Gartner named Vectra a Cool Vendor in Security Intelligence for addressing the challenges of post-breach threat detection. The American Business Awards also selected Vectra as the Gold Award winner for Tech Startup of 2015. Time is money in the fight against cyber threats and the number of attacks is rising steadily. The Vectra Attacker Behavior Industry Report 2018 presents behavioral analysis that indicates ongoing, persistent activity by attackers in corporate networks. Download now and learn more! Vectra is the only visionary in Gartners Magic Quadrant Report 2018. The reason? Download the Report and find out more. InfoGuard is an expert on behavioral Breach Detection. Our certified experts support from architecture and design as well as implementation and operation.